Malaysian Airlines Boeing 777, Flight MH370, disappeared from radar. 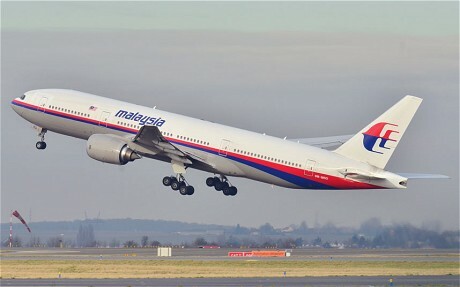 Malaysia is “almost certain” that plane debris found on Reunion Island in the Indian Ocean is from a Boeing 777, the deputy transport minister said on Thursday, heightening the possibility it could be wreckage from missing Flight MH370. Malaysia Airlines was operating a Boeing 777 on the ill-fated flight, which vanished without a trace in March last year while en route from Kuala Lumpur to Beijing in one of the biggest mysteries in aviation history. The plane was carrying 239 passengers and crew. Search efforts led by Australia have focussed on a broad expanse of the southern Indian Ocean off Australia, roughly 3,700 km (2,300 miles) from France’s Reunion Island. There have been four serious accidents involving 777s in the 20 years since the widebody jet came into service. Only MH370 is thought to have crashed south of the equator. France’s BEA air crash investigation agency said it was examining the debris, found washed up on Reunion Island east of Madagascar on Wednesday, in coordination with Malaysian and Australian authorities, but that it was too early to draw conclusions. 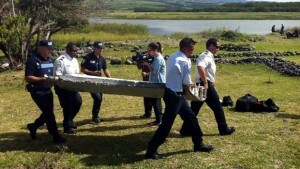 Aviation experts who have seen widely circulated pictures of the debris said it may be a moving wing surface known as a flaperon, situated close to the fuselage. “It is almost certain that the flaperon is from a Boeing 777 aircraft. Our chief investigator here told me this,” Malaysian Deputy Transport Minister Abdul Aziz Kaprawi told Reuters. Abdul Aziz said a Malaysian team was heading to Reunion Island, about 600 km (370 miles) east of Madagascar. It would take about two days to verify if the piece was from MH370, he added. A person familiar with the matter earlier told Reuters the part was almost certainly from a Boeing 777. The piece usually contains markings or parts numbers that should allow it to be traced to an individual aircraft, the person added. Investigators believe someone deliberately switched off MH370’s transponder before diverting it thousands of miles off course. Most of the passengers were Chinese. Beijing said it was following developments closely. The plane piece is roughly 2-2.5 metres (6.5-8 ft) in length, according to photographs. It appeared fairly intact and did not have visible burn marks or signs of impact. Flaperons help pilots control an aircraft while in flight. “The part has not yet been identified and it is not possible at this hour to ascertain whether the part is from a B777 and/or from MH370,” a BEA spokesman said in an email on Wednesday. Greg Feith, an aviation safety consultant and former crash investigator at the U.S. National Transportation Safety Board (NTSB), said his sources at Boeing had told him the piece was from a 777. Whether it was MH370 was not clear, he said. “But we haven’t lost any other 777s in that part of the world,” Feith said. Oceanographers said vast, rotating currents sweeping the southern Indian Ocean could have deposited wreckage from MH370 thousands of kilometres from where the plane is thought to have crashed. If confirmed to be from MH370, experts will try to retrace the debris drift back to where it could have come from. But they caution that the discovery is unlikely to provide any more precise information about the aircraft’s final resting place. “This wreckage has been in the water, if it is MH370, for well over a year so it could have moved so far that it’s not going to be that helpful in pinpointing precisely where the aircraft is,” Australian Deputy Prime Minister Warren Truss told reporters. Robin Robertson, an oceanographer at the University of New South Wales in Sydney, said the timing and location of the debris made it “very plausible” that it came from MH370, given what was known about Indian Ocean currents. Malaysia Airlines (MLYAF.PK) said it was too early to speculate on the origin of the debris. Boeing declined to comment on the photos, referring questions to investigators. Aviation consultant Feith said that if the part was from MH370, the bulk of the plane likely sank, while the flaperon had air pockets that allowed it to float below the water’s surface. Finding the wreckage would involve reverse engineering the ocean currents over 18 months, Feith said. “It’s going to take a lot of math and science to figure that out,” he said.